What if your bad habits were just a natural way of dealing with the density you hold? “Bad habits”—indulging in things we know aren’t good for our well-being… These are just unconscious ways of dealing with pain. Your bad habits don’t define you. They don’t make you a bad person, and in fact, when you become present, they can teach you a lot about yourself. When you bring conscious awareness to the WHY behind your habits, you can start to process and release the density and the emotions that gave you the urge to indulge in the first place. Create freedom from the chains of your habits and work towards greater alignment with all that you deeply desire. 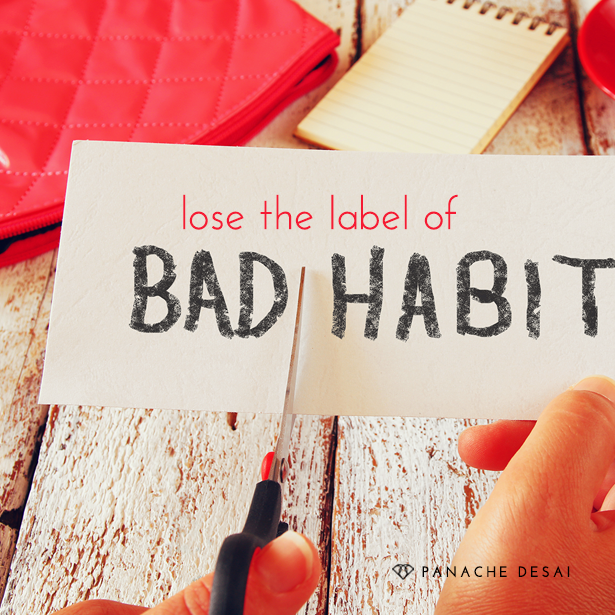 Are your bad habits robbing you of all that you deeply desire in life and if so, how can you break them? My sweet friends, we all have, throughout our years of life and living, accumulated what some may perceive to be bad habits. I’d like to redefine or reframe what they are by simply calling them unconscious patterns. Calling things bad habits in some way solidifies the judgement and then the guilt that we must experience as a result of engaging in those behaviors. Calling things bad habits perpetuates a vicious cycle that we can never break free of and it is for that reason that we must move into a more conscious place of understanding when we are automatically engaging in behaviors that don’t further our health, our well being or our self-care. My sweet friends, typically unconscious patterning is held in place by some form of pain or some unresolved emotion. At the root cause of your need to reach for food, to smoke a cigarette or to drink excessively, is anger, sadness and fear that hasn’t been experienced. Something occurs in your reality that makes you feel powerless and in turn makes you in some way need to assert some level of control. The more you can relax and the more you can slow down or introduce a level of mindfulness into your everyday behaviors, the more you can begin to dismantle everything that is unconscious. I want you to know that your unconscious patterns don’t make you wrong and they don’t make you bad. They don’t make you less than, that in truth, all they do is make you human. As we navigate this human experience it’s important to cultivate the courage then to begin to gain clarity about what the source of our behaviors are. I know for me, when I’ve gone to emotional places of stress or anxiety or anger, as with all people, I reach for something that provides comfort and, of course, that something typically isn’t very healthy and in some way impacts my health, vitality, and my energy levels and I know that for each of us we all have these behaviors that we engage in. It is for that reason that the more we are vigilant and the more we’re aware and the more we can stop and slow down and become aware of our breath in the moment then we can begin to dismantle the pattern by simply feeling the unresolved emotion that resides at its core. In the absence of the emotion, there is nothing holding the pattern in place. In the absence of the anger, fear and sadness there’s nothing to keep that fed any longer, it has no choice but to collapse, so please meet yourself with compassion. Lose the label of bad habit. Start to understand that you are experiencing nothing more than an unconscious pattern and the more you can shift into a place of empathy and compassion for self and awareness of self in the midst of behavior, the more you are breaking the cycle. As you begin to do this, you begin to move into greater states of love, and of course, the journey into conscious embodied enlightenment is the journey of making the unconscious conscious so that we can fully start to align with our soul and birth habits and patterns and behaviors from this space. Whether it be smoking, eating, drinking, playing video games, overly working, overly working out, whatever that may be, begin to get in touch with what’s really driving the behavior and in doing so, know that you are being freed, you are being expanded, you are being moved into greater alignment with all that you deeply desire. Stop, slow down, and take a breath and in doing so allow everything that you have been conditioned to believe is a bad habit or behavior to simply just fall away.